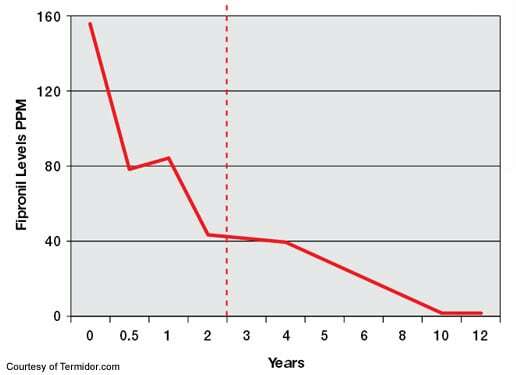 Our termite barriers last up to 8 years, depending on the chemical that is used. Termite barriers are an effective preventative measure & treatment in established residences. Chemical soil termite barriers will help prevent termites from gaining access into your building. They are usually introduced after laying concrete slabs on ground constructions & are applied around the perimeter of the building. The life expectancy of all chemicals used in termite protection vary, careful consideration should be given to the chemical used in this treatment. Once the chemical termite treated zone is installed, an on-going maintenance program is strongly suggested. Inspections are recommended at intervals not exceeding 12 months. Costing for the installation of a chemical barrier is estimated by the lineal metre age of the particular building perimeter. The design of each & every residence varies & therefore individual quotations are needed to ascertain costs. 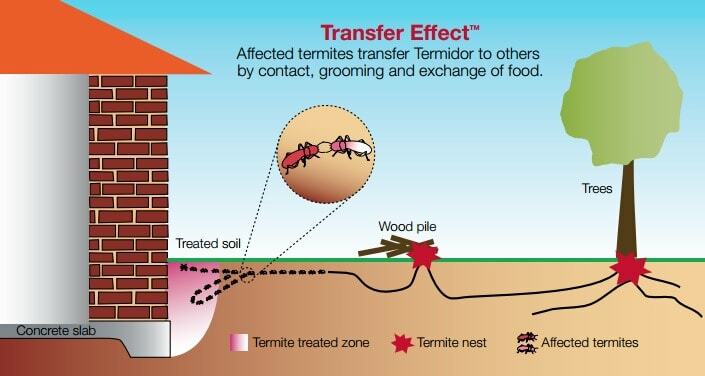 Brisbane Termite Services uses & recommends TermidorTM. Research shows that our treatments last well after major flooding. You will see that TermidorTM is still effective several years after a flood has happened. Want to find out simple ways for better protection for your property? Read our Termite Prevention Tips. The placement of a full chemical termite barrier to a buildings perimeter as per the Australian Standard (AS3660.2) specifies the procedures to be followed to provide a chemical soil barrier which will impede termites from gaining access to the termite susceptible members in the building. Section 8 does not refer to any specific chemical; instead it will allow any chemical that is registered by The National Registration Authority for Agricultural and Veterinary Chemicals to be used. All chemicals used in termite management have a limited life expectancy. Manufacturers of chemical Termidor recently indicated that this product has had proven protection for a minimum period of up to 8 years, however this is subject to soil conditions. 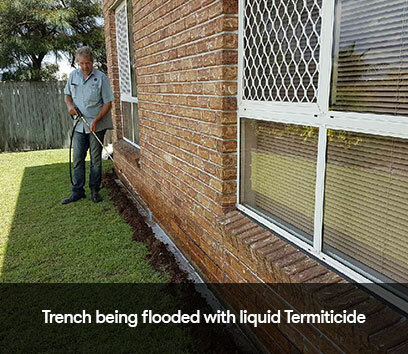 Termidor is the recommended chemical used by Brisbane Termite Services to provide a chemical treated zone barrier around all residences. Drilling of 10mm holes spaced approximately 200mm’s apart along any concreted perimeter of the external walls of the building. Injection of a registered termiticide. 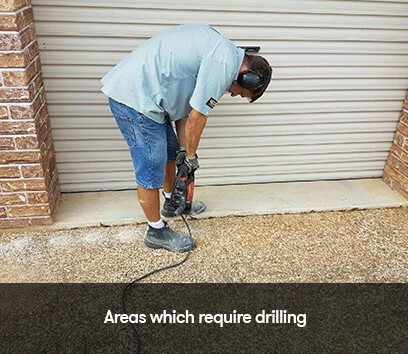 (Termidor) Drill holes to be filled on completion. Excavate trenches or rod inject, until the depth of the footing is reached. 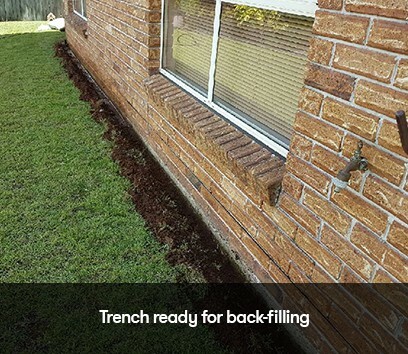 Treat the exposed trench by flooding with chemical. Soil once treated, is then replaced. Brisbane Termite Services offers a service free period of 12 months on completion of a perimeter barrier installation. This service free period is extended each year once a Visual Subterranean Termite Inspection is conducted by this Company. Termstop is an Australian owned company committed to manufacturing quality products for the construction industry. We develop, test and manufacture our products in Australia using quality local raw materials. We understand that our products have offer to great value to pest managers, that’s why they are high quality, easy to use and, with correct maintenance, will keep working year after year. Reticulation systems have been used to protect buildings for many years, however some systems are difficult to handle and install. Termstop Reticulation is a precision drilled flexible hose which delivers a pesticide to create a treated zone around the buildings. The flexible hose means that installation can be done quickly and easily with a minimum number of fitting.